This next device is quite similar to the ZOMM in the sense that it can help you not forget your keys. 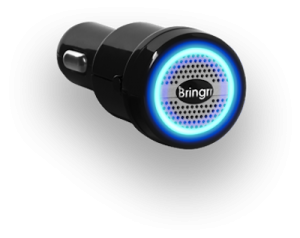 Like the ZOMM, the Bringrr is able to sync wirelessly to your cellular phone via Bluetooth. Unlike the ZOMM, it appears to be designed to say in the car, and use on of the cigarette lighter outlets as a power source. So, if you get in the car, and you forget your cellular phone, the Bringrr will sound an alarm. Then you can stop your car, get out and get your phone and be on your way before you miss some important phone call. You will notice how I keep comparing the Bringrr to the ZOMM. I guess that until now, I thought the ZOMM was really the only product of its type. Something tells me that this product will not be the last of its type. As long as people keep forgetting their cellular phones, there will always be a product designed to prevent it. And the company that makes these products will make a profit, hopefully. So how much would you pay not to lose your cellular phone? How about $35, because that is about the cost. I don’t think I’ve lost my cell before, but it did get busted up, and it cost $50.00 to replace. I suppose $35 is a small price to pay to avoid a similar bad experience. The underlying principal for the founding of GoldBank is that the U.S.A is entering a very long period of negative economic growth (inflation adjusted) and that our government solutions of more debt and more money printing will only exacerbate the problem --- more debt on the backs of our children and a destroyed currency.